Now understand working according to given table. In circuit diagram at Q1 LIGHT is connected, at Q2 FAN is connected and at Q3 TV is connected through relay driver IC. We have left Q4. Now when we press key 1 at the dial pad of mobile phone DTMF decodes this tone and generates a digital output given in table. Now According to given output in table Q1 is HIGH and Q1 is connected with light so LIGHT turned ON. If we want turned OFF the LIGHT, we need to press key number 8. Because in the output of key8, Q1, Q2 and Q3 LOW and Q4 are HIGH and we have not used Q4. So it doesn’t matter that Q4 is HIGH or LOW. But our operation has been performed because Q1 is LOW in key 8’s output and rest of appliances not affected. Now is we want to turned on FAN so we need to press key2 because by pressing key2 only Q2 is activated and rest of output are remain same. Now if we to OFF the FAN then we need to press key8 again like before for as LIGHT. Now if we want to TV so we need to press key4 and for tuning it OFF we need to press 8 like before. Now suppose we want to turned ON all of the appliances so we need to press key7 (see table) and for turning OFF all key8 (see table). Now if we need to ON LIGHT and FAN so we need to press key3 (see table). And now we want to ON TV so we need to press key 7 not key4. Because we should keep remain turn ON previous appliances. Now if we want to turn OFF only LIGHT so we need to press key6. Because we should again to keep remain turn ON the previous appliances except LIGHT. So we can control each of the appliances according to table output. Circuit diagram for DTMF controlled home automation project is shown above. In this circuit we have used a DTMF decoder namely MT8890 IC which converts dial pad tone into the four bit digital output. LIGHT, FAN and TV are connected to Q1,Q2 and Q3 of DTMF decoder IC through a relay driver namely ULN2003. 5 volt SPDT 3 relays are used for controlling LIGHT, FAN and TV. 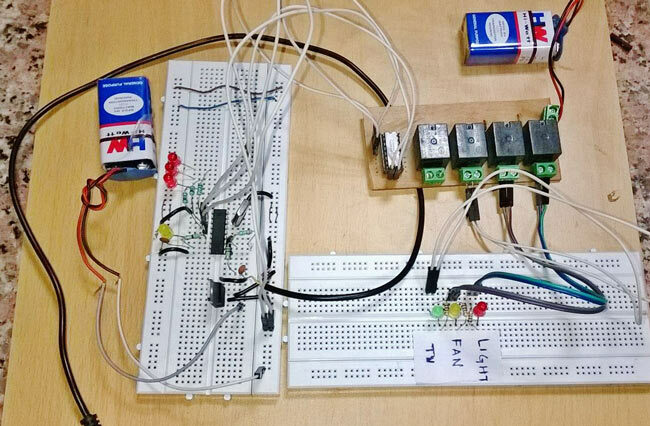 For demonstration of this project we have connected three LEDs at relay instead AC appliances. And we have also used 9 volt dc battery instead 220VAC for driving LEDs. Yes, it should work during the call. How have you connected the aux cable to the dtmf decoder chip? please help me. For simulation of this circuit which software is more efficient? by using four 4 or 5 push buttons you can simulate it at proteus. can we drive a electric fan working on ac power supply at home using this circuit?how can we do this?please help us. yes, you can drive any AC home appliances. can we use ht9170 decoder instead of mt8870? here in dis components list they have mentioned about PVT, I just wanted to know what is PVT and what are its uses and application. Sir, what is the use of the other 4 led(3 red and 1 yellow), would u plz explain? These are indication LEDs, when we connect the actual AC appliances in places of 3 LEDs at the Right side, then these LEDs work as indicators. All the led's are not going off after pressing 8,( my circuit is correct)?? Can we control home appliances using dtmf tone, through wifi lan connection...if yes then please send me a solution, that how it will work..
please let me know the use of ULN2003 driver in this project? Can v operate this from any place??? what is PVT in the components given...? PVT is Terminal Block, Green color block adjacent to each Relay (see picture), to secure wires with screws. There are so many softwares are available for Schematic to PCB layout conversion like Easy EDA, Fritzing etc, check this: Design Your Circuits Online for Free with EasyEDA and Yes you can use any electronic AC appliances to be controlled. What is the PVT mentioned in the list of apparatus..? No, it not requires programming. You can use the same circuit but you have to replace the Relay for handling 440 v, the relay used in this circuit can handle upto 250v. what are the function of pin number 5&6 of IC MT8870? Yes, It will remain in the same state. Can we use TRIAC instead of 5v relay in this circuit? Many people keep asking whats pvt .no one answered that. Someone please tell what does pvt stand for atleast??! I know its a lot to ask but Can you send me the final project Report of this it'll be really helpful and Thank you very much the project is really Great and its working Perfectly. I want to control the appliances wirelessly (using another phone to control the whole circuit). can any one help me out with the necessary things to add? You can control it via other phone, just call on the mobile phone near the circuit and dial the no from the other phone, check this circuit video for more detail. I made this circuit on pcb as per diagram but it's not working. led 1,2,3 is continuously on and IC MT8870 is heating more. can I connect DTMF IC directly to relay? what is a roll of driver ic? Relay should be used with a driver circuit of Transistor and diode to make it work properly, check here for more detail. And ULN2003 IC has inbuilt darlington transistor pairs and other circuitry to drive relay. why another 9v battery is used at relay? is it must to connect ? You can use only one battery as per circuit diagram. How to prevent calls from other mobile and mall functioning of DTMF decoder as any one can dial mobile connected to circuit. I want exclusive control with only specific mobile. Easiest way is to use exclusive sim card for that mobile, otherwise you need use some microcontroller and GSM module to filter the incoming mobile number. I can control it from anywhere. Another mobile calls.? Sir,it says,that whenever we forget to switch off the appliances,that time this circuit is used.But sir,in video,we have to keep on our appliances and off,when phone call is dialled.but when switch is already on,and if we want to switch off the appliance,then how we do that?.because,if we off the switch during phone call,after phone call ends,the appliances will remain on.so,the purpose is not achieved.please please tell me. I made this circuit on PCB it can not working. At the time of starting when i connect the supply directly 12 and 13 pin LED is start to glow without any given input. please help sir. What is the name of the simulation program please ? Please read the above comments before posting, your question might have already answered. What if I use headphone jack instead of aux cable? can i use any smartphone or is it necessary to use any specific phone to interface? sir is it a must to have relays between the leds and the ic mt8870? No, you can use Transistors to trigger LEDs. Relays are for the purpose of switching AC appliances. I complete made this circuit but auxaux wir how to connect?????? What is the use of crysal oscillator. In the circuit ?? 1. Is this all the circuit you got ?? 2. Does it has any coding or not? 3. Did anyone has tried that? What is the cost of the project....??? Please how do I make the phone answer when called if I'm not around to pick it?